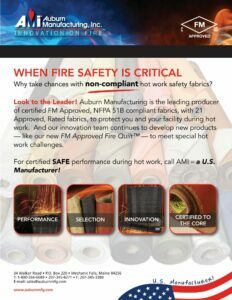 Why take chances with “non-compliant” hot work fabrics? Understand the risks and get a full listing of all of our 21 FM Approved options. 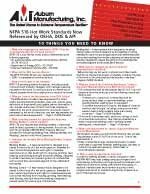 Brief video presentation on what the latest NFPA 51B requirements are with respect to hot work fabrics. 3-in-1 versatile, transportable protection. Use as Curtain, Blanket or Pad. 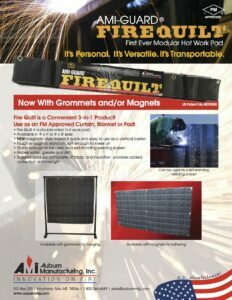 Two -page brochure includes full listing of all of AMI’s 21 FM Approved products. Disponible en español. 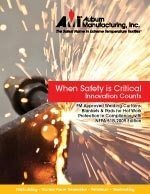 This guide provides a quick glance at all of AMI’s FM Approved hot work fabrics. 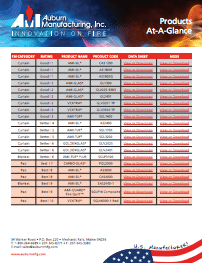 The chart lists the categories, performance ratings and product codes for each. Quick links to the data sheets and SDS are also provided. Is Your Hot Work Policy in Compliance? Learn more about the FM Approvals performance rating system adopted by ANSI and NFPA. See a side-by-side comparative fire test of welding blankets. Learn how to identify certified products to ensure compliance. Or click here to watch the video now online. 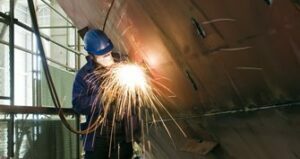 FM Approved Welding Blankets, Pads & Curtains For Fire Protection During Hot Work: Safety Professionals in critical industries such as Shipbuilding, Nuclear Power Generation, Petroleum and Steelmaking know that unprotected hot work is a leading cause of industrial fires. 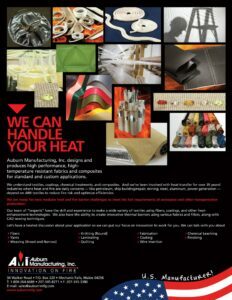 This brochure provides information on Auburn Manufacturing Inc.’s (AMI’s) wide range of Approved and Rated fabrics to protect people, plant and equipment from heat, sparks, and molten metal in the workplace. Disponible en español.